When it comes to enjoying food in your garden, you may be looking for something more sociable than a patio set. Picnic benches are a popular choice for use in public spaces such as outside pubs and cafes, or in the grounds of parks and picnic grounds, but this doesn’t have to always be the case. 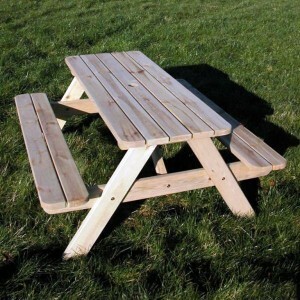 We have a range of picnic benches that will suit any sized patio or garden, from circular tables to traditional and even junior benches for children. Picnic benches are perfect for your garden as you can easily move it around without having to position several chairs as well. As the seating is attached to the table it allows more space as chairs will not have to be moved in and out for people to sit down. Our classic rectangle style picnic tables are perfect for lunches with your friends and family and typically seat six to eight people in comfort. Our rounded tables allow a more social environment as you are all sat facing each other, encouraging conversation. These are great for use anywhere in the garden; simply choose your favourite spot! Our selection of picnic benches come with easy to follow instructions to help with the construction. We also provide FREE home delivery and up to 15 years guarantee against rot so you can have peace of mind with your new furniture. 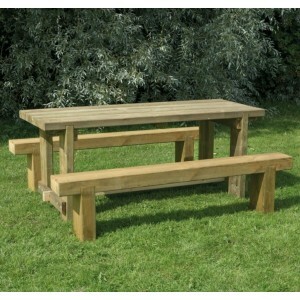 This sturdy hard-wearing 1.2m Refectory Table and Sleeper Bench set from Forest is perfect for a sma.. This sturdy hard-wearing Refectory Table and Sleeper Bench set from Forest is perfect for a small.. This A-Frame Picnic Table is designed to seat up to 6 people across its two parallel benches and .. 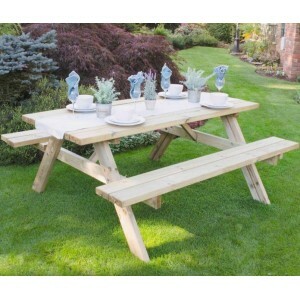 The Alex Octagon Picnic Table by Zest is perfectly designed for entertaining family and friends in t.. 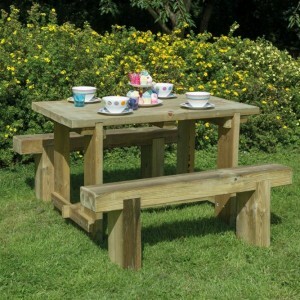 The Brentwood Picnic Table from BrackenStyle is made using smooth planed 30mm thick New Zealand P.. 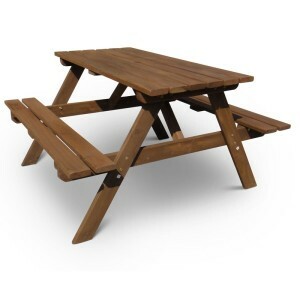 The Chester A-Frame Picnic Bench is a rectangular table with parallel seats in two sizes to accom.. 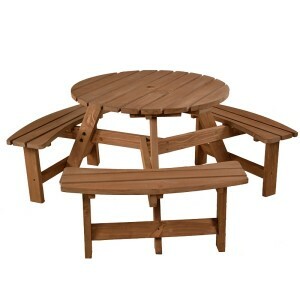 The Circular Picnic Table from Forest features a round table top set onto a sturdy cross frame with .. 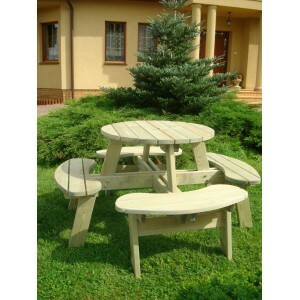 The Circular Picnic Table With Backrests from Forest features a round table top set onto a sturdy cr.. 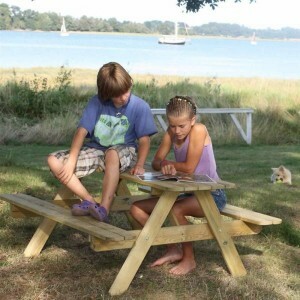 The strong and durable Jersey Picnic Table from Boon is made using 32mm thick FSC pine for extra .. 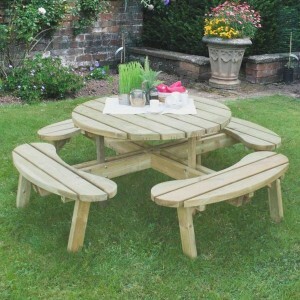 The Katie Round Picnic Table from Zest 4 Leisure is a compact design, ideal for smaller gardens and .. 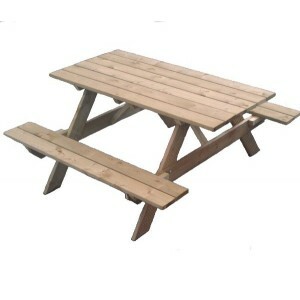 The Katrina Picnic Table from Zest is the ultimate dining product for the summer as you can enjoy ea.. 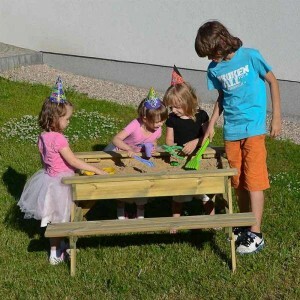 The Marta Children's Picnic Table by BrackenStyle is perfect for children to enjoy at home or in a c.. The Marta Sandpit Table by BrackenStyle is an excellent multi-purpose product, which is bound to giv.. The Rectangular Picnic Table from Forest features a traditional A-frame design; perfect for outdoor .. The Rose Round Picnic Table from Zest is perfect for entertaining a larger party of guests, comforta.. 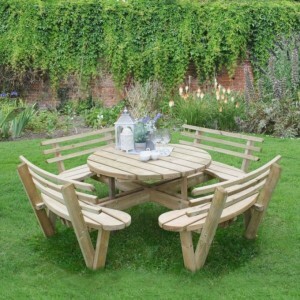 The Sacramento 8 Seater Picnic Bench by Royalcraft is perfect for garden parties during summer and p.. 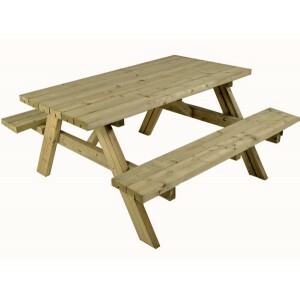 The Whitby Picnic Bench is a heavy duty construction set on an A-Frame with parallel seating that..